This sky map shows where Mars will appear in the eastern sky on March 5, 2012 at 8 p.m. local time to observers at mid-northern latitudes. The planet Mars will make its closest swing by Earth in more than two years tonight (March 5), just days after reaching a celestial milestone called "opposition" as it circles the sun. If your weather is clear, you may see Mars shining bright in the eastern sky as a brilliant reddish-orange "star." The sky map of Mars for this story shows how it will appear in the evening sky tonight. The Red Planet's closest approach to Earth comes just two days after Mars reached opposition, the point in its orbit where it appears exactly opposite the sun as seen from Earth. Mars hit opposition on Saturday (March 3), which the online skywatching website broadcast live with free telescope views. This still from a Slooh Space Camera webcast shows Mars as it appeared at opposition on March 3, 2012 at 11:30 p.m. ET (0430 GMT on March 4). "We're focusing on Mars because this is the week when it's brightest," astronomer Bob Berman of Astronomy Magazine said during the webcast. Through the Slooh space camera, which provided a view of Mars through telescopes at observatories in Arizona and the Canary Islands, the Red Planet's full disk could be seen, including its northern polar ice cap and broad features. For skywatchers tonight, Mars will appear as a bright light in the sky unless you have a small or medium telescope, which can resolve the planet's disk, NASA officials said in a video. It is only in telescope views that features like the ice cap, can be seen, they added. The next Mars opposition won't occur for another 26 months (set your calendars for 2014), when orbital mechanics will bring Mars even closer to our world. The last time Mars made a dazzling close approach to Earth was on Aug. 27, 2003, when the Red Planet was about 34.6 million miles (55.7 million km) from our planet — its closest approach in nearly 60,000 years. Mars is not the only bright planet shining in the nighttime sky this week. The planets Mercury, Venus, Jupiter and Saturn will all appear as celestial night lights for skywatchers with cloud-free skies. Tonight, Mercury will reach its highest altitude in the western sky just after sunset, Jones said. Meanwhile, Venus and Jupiter also make dazzling displays in the western evening sky as they steadily creep closer together. On March 12 and 13, the two planets will appear so close you could block them with your fingertips, NASA officials have said. Venus is the brighter of the two planets, which will pass each other in the sky during this two-day celestial dance. This still from a NASA video shows the location of planet Mercury in the night sky just after sunset on March 5, 2012. Earth's moon will also serve as a guide to spotting two planets, Mars and Saturn, this week. On Wednesday (March 7), the moon will appear close to Mars in the late-night sky around 11 p.m. local time, then serve as a signpost for Saturn when it appears near the ringed planet on March 10 and 11, Jones explained. 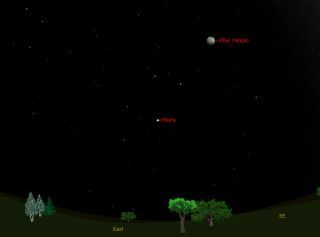 The moon will also appear near Jupiter and Venus on March 25 and 26 in a repeat performance of a stunning February "triple play" by the three objects. "Not a week goes by this month when there isn't an amazing planetary view," Jones said. If you snap an amazing photo of Mars, the planets, or any other skywatching target and would like to share it for a possible story or image gallery, please contact SPACE.com managing editor Tariq Malik at tmalik@space.com.